Getting the name from their distinctive and resounding whip crack duet they perform (other names Stockwhip Bird & Coachwhip Bird) they are mainly found in wet gully & wet Eucalyptus forests, rainforests, heaths and dense bush land of coastal Eastern Australia. 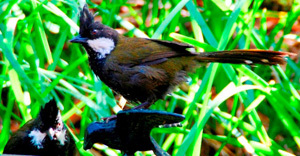 Ranging from south of Melbourne to just north of Cairns these birds are shy, elusive and well camouflaged, and although often heard, they are rarely ever seen. 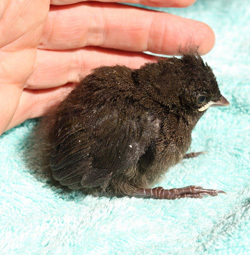 There is also their smaller more olive/grey cousin the Western Whipbird who has 5 main populations in SA, Kangaroo Island, the western Victorian border & parts of WA. 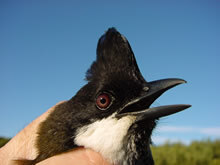 The male and female Eastern Whipbird are similar in colour and size with a black head and crest, back of body, wings and tail olive green, under cheeks broadly white extending on to their throat, centre throat & breast black grading to mottled white on belly and dusty olive green on flanks and under tail which has white tips. They have a red/brown eye, feet & legs and a black beak. Established pairs hold permanent territories of about 5-10 hectares where they, with their young of that year, feed actively in the litter on the forest floor. They fly/hop with their tail fanned, foraging mainly on foot throughout the day turning over leaf litter with their powerful feet to feed on a wide range of insects, larvae and small crustaceans. They will search through shrubberies & fallen logs all the while calling to each other. 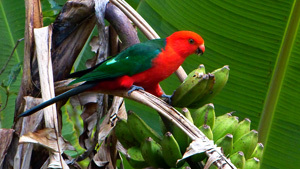 Breeding season is July – January when the female builds a shallow bulky cup nest of loosely interwoven twigs lined with rootlets & fibre only 0.5 – 4 metres at most above ground in thick foliage of dense shrub or vine in the undergrowth. Often in the afternoon the female lays 2 pale blue eggs that have little irregular black & lilac spots. She then incubates the eggs for 17-18 days with the male through this time feeding her. 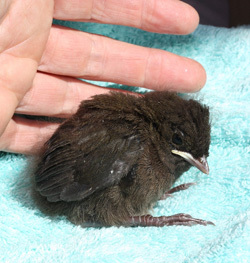 Both parents feed the chicks which are covered in fine black down and who will leave the nest after 10-14 days before they have fully fledged to hide, perched still in the undergrowth, for a week or so until they can fly. During this time both normally shy parents become fearless in defence of their chicks. Most noted in the wild for their amazing antiphonal “whip crack” song which the male initiates with a long whistle swelling into a drawn out crescendo in the same pitch ending with a swirling upsweep, the “whip crack”. The female responds at once with a few sharp “choo choo”. 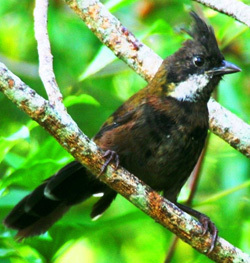 Both male and female combine to produce this song antiphonally, call and answer sequence, to signal their territory and to identify the caller’s position in this way keeping in touch as they forage up to 30 metres apart through the dense forest underbrush. The male’s song is one of the most extraordinary and beautiful in the bird kingdom. 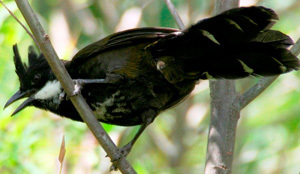 A survey was done where over 110 birds from 16 different populations recorded, found that although the male songs were virtually identical with no accent, the female songs showed variations singing the same basic song but with regional accents! These geographical accents are also found in whales, seals and some primates.